Cop owners of the popular Clare doughnut shop pose outside the flagship. The famous Clare, Michigan doughnut shop, Cops & Doughnuts, announced today that it is purchasing Bay City's historic Sutherland's Bakery on Midland Street. C&D also bought McDonald's Bakery in Ludington to be named The "McDonald's Precinct" that will open on May 15. "Just like Clare, our nine cop-owners are on a mission to save historic bakeries around Michigan and even beyond," said President Greg "Ryno" Rynearson. McDonalds Bakery in Ludington has been run by the McDonald family since 1898. Sutherland's Bakery in Bay City also dates back to the late 1800's. Sutherland's, that had been owned by three generations of the Sutherland family is located at 710 E. Midland St., Sutherland's Bakery has been known over the years for its delicious rolls and bread, as well as doughnuts and cookies. The business closed on Christmas Eve 2014. 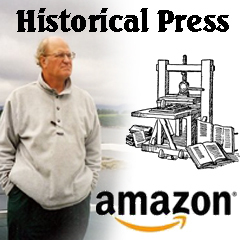 Then it was owned and operated by Geraldine and Edwin Rezler and their son Michael and in September 2015 Valerie Willis and Randy Hodder of Saginaw took over and operated under the name O'RHanges Sutherland's Bakery. "It is an honor to be part of saving these historic bakeries," said Vice President Al "Bubba" White. White said the two bakeries are just the start. "We have our police sights set on several other locations and we are always looking for more," White said. "Soon we will be offering franchise opportunities coast to coast nationwide." 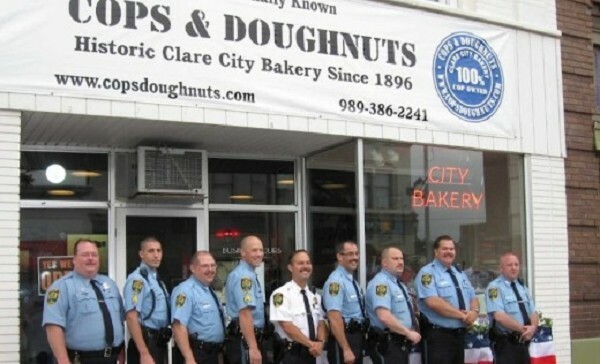 Cops & Doughnuts began in 2009 when all nine full-time officers of the Clare City Police Department pooled their own money to save the citY's only doughnut shop from going out of business. The original Cops & Doughnuts bakery in Clare has added approximately 60 new jobs to the community. The Gaylord location brought eight new jobs to northern Lower Peninsula. The new Cops & Doughnuts locations in Ludington and Bay City collectively will create about 20 new jobs. "We have been so blessed with the support of our Clare community family and have been equally blessed by the communities of Ludington and Bay City," Rynearson said. "We look forward to making, even more, friendships in the months and years to come." The popular doughnut shop has won scores of fans, including one who posted the following on the firm's website: "What a fun place! We stop at Cops And Donuts every time we go up north. They offer all of the standards - cinnamon sugar cake donuts, cookies, Bismarck, custard-filled long johns, etc. In addition, they have many fruit-filled hand pies to choose from, crazy-good stuff like maple glazed donuts with bacon strips on top, and giant whoopee pies. And of course, there is a case of pies to choose from, racks of different breads, police memorabilia, and a huge gift shop. We have never eaten in the diner - we always go for the donuts - but I am told that the food is good."